The Battle of Hastings was the decisive Norman victory in the Norman conquest of England. The location was Senlac Hill, approximately six miles north of Hastings, on which an abbey was subsequently erected. The battle took place on October 14, 1066, between the Norman army of Duke William of Normandy, and the English army led by King Harold II. Harold was killed during the battle. It is traditionally believed he was shot through the eye with an arrow. Although there was further English resistance for some time to come, this battle is seen as the point at which William I gained control of England. The famous Bayeux Tapestry depicts the events of the battle. The Battle of Hastings marked the end of Anglo-Saxon England, an era which many remembered with nostalgia in later years. The battle is generally seen as a tragic affair, the prelude to unwelcome changes in the English way of life. Certainly, what emerged subsequently was a new identity, one that fused the old with the new. The conquest changed the English language and culture. It also weakened tries with Scandinavia and strengthened those with France, although what emerged was centuries of often violent rivalry. All successive English monarchs subsequently also styled themselves Kings of France until George III dropped his claim. Effectively, the Battle of Hastings determined the character of Anglo-French relations until the beginning of the twentieth century, that is, they were hostile. The two nations only became allies with the Entente Cordiale of 1904, when they exchanged hostility for cooperation in the face of the new perceived common threat—Germany. Had William I of England not invaded, and defeated Harold II, England as an island nation may have stayed clear of being embroiled in European affairs, but William I also bequeathed his successors with title to French territory, which subsequently had to be defended, if not expanded. It was the loss of the last French enclave, Calais in 1558, that spurred the English to look elsewhere for an empire, establishing Jamestown, the first colony in North America, almost fifty years later. Harold had claimed the throne of England for himself in January of 1066, soon after Edward the Confessor died. He secured the support of the Witenagemot for his accession. Some sources say that while Edward had promised the throne to his cousin William, on his deathbed he decided to confer it to Harold instead. On September 28, 1066, William of Normandy, after being delayed by a storm in the English Channel, asserted his claim to the English crown by military force, landing unopposed at a marshy, tidal inlet at Bulverhythe, between what are now the modern towns of Hastings and Bexhill-on-Sea. The Bulverhythe beachhead is within two miles of the Senlac battlefield, is sheltered, and has access to high ground, while Pevensey, which had long been held to be the Duke's landing place, is marsh-bound, presenting problems for off-loading troops, horses, and stores, and remote from the road to London. Legend has it that upon setting foot on the beach, William tripped and fell on his face. Turning potential embarrassment in front of his troops into a face-saving exercise, he rose with his hands full of sand and shouted "I now take hold of the land of England!" This bears suspicious resemblance to the story of Julius Caesar's invasion of Britain, and was perhaps employed by William's biographer to enhance the similarities between Caesar and William. Upon hearing the news of the landing of the Duke's forces, the Saxon Harold II, who had recently destroyed an invading Norwegian Viking army under King Harald Hardråda and Tostig Godwinson (Harold's brother) at the Battle of Stamford Bridge, hurried southward from London. He departed the morning of the 12th, gathering what available forces he could on the way. After camping at Long Bennington, he arrived at the battlefield the night of October 13. Harold deployed his force, astride the road from Hastings to London, on Senlac Hill some six miles inland from Hastings. Behind him was the great forest of Anderida (the Weald), and in front, the ground fell away in a long glacis-like slope, which at the bottom rose again as the opposing slope of Telham Hill. The Saxon force is usually estimated at seven to eight thousand strong, and consisted entirely of infantry (the English rode to their battles but did not fight from horseback). It comprised the English men-at-arms of the fyrd, mainly thegns (the English equivalent of a land-holding aristocracy), along with lesser thegns and a core of professional warriors: Housecarls, the King's royal troops and bodyguards. The thegns and housecarls, probably veterans of the recent Stamford Bridge battle, were armed principally with swords, spears, and in some cases the formidable Danish axes, and were protected by coats of chain mail and their usually circular shields, as well as kite shields. They took the front ranks, forming a shield wall with interlocking shields side by side. The entire army took up position along the ridge-line; as casualties fell in the front lines the rear ranks would move forward to fill the gaps. On the morning of Saturday, October 14, 1066, Duke William of Normandy gathered his army below the English position. The Norman army was of comparable size to the English force, and composed of William's Norman, Breton, and Flemish vassals and allies along with their retainers, and freebooters from as far away as Norman Italy. The nobles had been promised English lands and titles in return for their material support, but the common troopers were to be paid with the spoils and "cash," and hoped for land when English fiefs were handed out. Many had also come because they considered it a holy crusade, due to the Pope's decision to bless the invasion. The army was deployed in the classic medieval fashion of three divisions, or "battles"—the Normans taking the center, the Bretons on the left wing and the Franco-Flemish on right wing. Each battle comprised infantry, cavalry, and archers along with crossbowmen. The archers and crossbowmen stood to the front for the start of the battle. Legend has it that William's minstrel and knight, Ivo Taillefer, begged his master for permission to strike the first blows of the battle. Permission was granted, and Taillefer rode before the English alone, tossing his sword and lance in the air and catching them while he sang an early version of The Song of Roland. The earliest account of this tale (in The Carmen de Hastingae Proelio) says that an English champion came from the ranks, and Taillefer quickly slew him, taking his head as a trophy to show that God favored the invaders: Later twelfth century sources say that Taillefer charged into the English ranks and killed one to three men before suffering death himself. Regardless, fighting was soon under way in earnest. William relied on a basic strategy with archers in the front rank weakening the enemy with arrows, followed by infantry which would engage in close combat, and finally culminating in a cavalry charge that would break through the English forces. Yet from the very beginning, William's plan went awry. The archers had little effect on the English shield wall because Harold had his men placed on the top of a hill to prevent the arrows from hitting them. Before the infantry could engage the Housecarls, a shower of stones and projectiles flung by the English caused heavy casualties amongst the Norman ranks. William, realizing that his attack was failing, was therefore forced to order his cavalry to attack far sooner than he had anticipated. 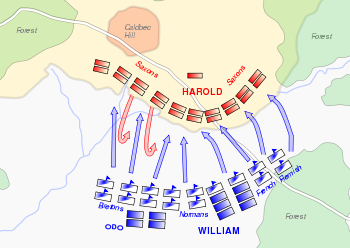 Yet due to Harold's position, William's cavalry charge fizzled out as the horses struggled uphill. The still-intact English shield wall easily held back the Norman cavalry and, much to William's chagrin, many of Harold's housecarls were highly-skilled with the Danish battle axe, capable of causing ghastly wounds to a horse and its rider. Apparently without warning, the Breton division on William's left fled. Realizing that they would be quickly outflanked, the Norman division then began to withdraw followed quickly by the Flemish. Seeing the enemy's retreat, many of the English fyrdmen (along with Harold's brothers, Leofwyne and Gyrthe) broke ranks and began to pursue. In the following confusion, William's horse was killed from underneath him and the Duke toppled to the ground. Witnessing the apparent death of their leader, the Normans began to panic and take to flight. Yet just when victory seemed to belong to the English, William himself took off his helmet to show he was alive and rallied a handful of knights to his person. In a moment of decisiveness, William and his knights charged their pursuing enemies, now no longer protected by the orderly shield wall, and cut down large numbers of undisciplined fyrdmen. With the tables so suddenly turned, many of the English did not recognize the Norman counter-attack until it was too late. Some managed to scramble back uphill into the protective ring of housecarls; others, including Harold's brothers, were not so fortunate. As the remaining English pursuers rejoined the main force, a brief respite came over the battlefield. William himself took advantage of this momentary rest to ponder a new strategy. The Norman's near rout had turned to William's advantage since the English lost much of the protection provided by the shield wall when they pursued. Without the cohesion of a disciplined formation, the individual English were easy targets. Keeping this in mind, William re-engaged Harold's force. Early historians state that the Normans repeated a number of feints to draw out small groups of Englishmen and then cut them down. However, later historians have commented on the difficulty of such a complicated maneuver. Whatever happened, it is almost certain that as the English shield wall grew smaller and smaller, many of the fyrdmen in the back ranks clustered closer together behind the thinning wall of housecarls. The English force now provided an interesting opportunity to William. Until then, William's archers had always fired directly into the English force (and was therefore ineffective due to their interlocking shields). Now, William ordered his archers to fire directly over the shield wall so that the arrows landed into the clustered back ranks of the English army. This the archers did, and with great success. 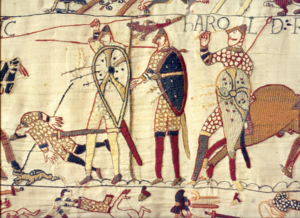 It is believed by some that Harold was hit in the eye with an arrow although that is purely speculation taken from a scene depicted in the Bayeux Tapestry. Whether Harold was hit or not, when the two forces engaged again, William and a handful of knights managed to break through the shield wall and strike down the English king. Without their leader, many of the thegns and fyrdmen panicked and retreated, while Harold's personal bodyguard and a number of his veteran housecarls fought to the end. Only a remnant of the defenders made their way back to the forest. Some of the Norman forces pursued the English, but were ambushed and destroyed in the halflight when they ran afoul of steep ground, called, in later (twelfth century) sources, "the Malfosse," or "bad ditch." William rested his army for two weeks near Hastings, waiting for the English lords to come and submit to him. Then, after he realized his hopes of submission at that point were in vain, he began his advance on London. His army was seriously reduced in November by dysentery, and William himself was gravely ill. However, he was reinforced by fresh troops crossing the Channel. After being thwarted in an attempt to cross London Bridge, he approached the city by a circuitous route, crossing the Thames at Wallingford and advancing on London from the north-west. The northern earls, Edwin and Morcar, Esegar the sheriff of London, and Edgar the Atheling, who had been elected king in the wake of Harold's death, all came out and submitted to the Norman Duke before he reached London. William was crowned king on Christmas day at Westminster Abbey. Battle Abbey was built on the site of the battle. A plaque marks the place where Harold is believed to have fallen, and the location where the high altar of the church once stood. The settlement of Battle, East Sussex, grew up around the abbey and is now a small market town. The Bayeux Tapestry depicts the events before, after, and at the Battle of Hastings. The Battle of Hastings is also an excellent example of the application of the theory of combined arms. The Norman archers, cavalry, and infantry co-operated together to deny the English the initiative, and gave the homogeneous English infantry force few tactical options except defense. However, it is quite likely that this tactical sophistication existed primarily in the minds of the Norman Chroniclers. The account of the battle given in the earliest source, the Carmen de Hastingae Proelio, is one where the Norman advance surprises the English, who manage to gain the top of Senlac Hill before the Normans. The Norman Light Infantry is sent in while the English are forming their Shield Wall (to no avail) and then the main force was sent in (no distinction being made between infantry and cavalry). Interestingly, it records the first retreat of William's forces as the result of a French (not Norman) feigned retreat that went wrong, the English counter-attack, William counter-counter-attacks, and it all develops into a huge melee during which Harold is slain by a group of four knights and therefore the bulk of the English army flee. Succeeding sources include (in chronological order) William of Poitiers's Gesta Guillelmi (written between 1071 and 1077), The Bayeux Tapestry (created between 1070 and 1077), and the much later Chronicle of Battle Abbey, the Chronicles written by William of Malmesbury, Florence of Worcester, and Eadmer's Historia Novorum in Anglia embellishes the story further, with the final result being a William whose tactical genius was at a high level—a level that he failed to display in any other battle. Most likely the simplest explanation is that the English were exhausted and undermanned, having lost or left behind their bowmen and many of their best housecarls on the fields of Fulford Gate and Stamford Bridge, or on the road from York. This weakness, rather than any great military genius on the part of William, led to the defeat of the English at Hastings. ↑ Glen Ray Crack, Harold's Battle Force. Retrieved July 24, 2006. Crack, Glen Ray. The Battle of Hastings 1066. Harold's Battle Force. Retrieved July 24, 2006. Howarth, David. 1066: The Year of the Conquest. New York: Barnes and Noble, 1993. The Battle of Hastings - 1066 Includes facts and full story. History of "Battle of Hastings"
This page was last modified on 17 May 2016, at 14:58.